6. Place the flattened fillet in the centre of the pancetta and arrange the capsicum strips in the centre. 7. Mould a tapered log of the stuffing and align it with the capsicum. 8. Carefully roll the entire breast using the pancetta to 'seal' the roulade. 9. Spray a roasting dish with olive oil and place the roulade with the pancetta strip ends facing down and spray lightly with olive oil. 10. Repeat the above with the remaining fillets. 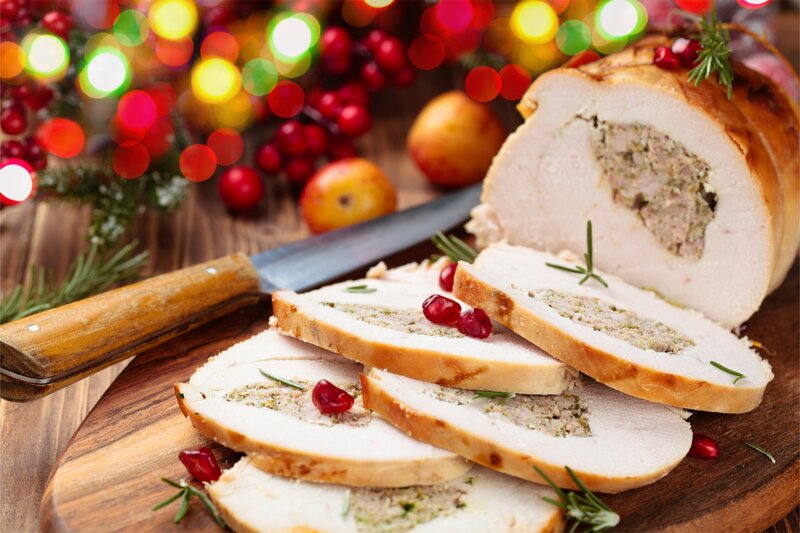 If you use turkey breast, ask your butcher to slice the breast into flat 2 cm long, thick slices (explain what you want them for). Strapped for time on the day? Prepare the roulades the day before, cover with plastic wrap and refrigerate them uncooked. Cook them on the day to serve warm. Note you may notice that the chicken/turkey meat that is in contact with the pancetta is pink. Don't worry, it is cooked, it's just the colour from the pancetta. Serve with some low FODMAP roast veggies e.g. carrots, potatoes, parsnips, turnips, celeriac and Jap pumpkin. Serve with delicious low FODMAP cranberry sauce!